In addition, this box set features tracks from Ronnie’s Mahoney’s Last Stand soundtrack album with Ron Wood and Rough Mix with Pete Townshend. ​Also featured throughout the sets are lots of rare and unreleased material! Be prepared to hear fantastic cover versions of The Wanderer, Rocket’ 69 and The Joint Is Jumpin’ - as well as unheard Ronnie compositions plus live recordings, tracks for the BBC and highlights from the legendary Rockpalast concert. 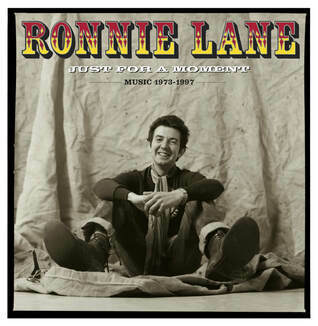 The Ronnie Lane Just For A Moment 6 CD Box Set has been lovingly curated by long time musical associate of Ronnie’s, Slim Chancer musician Charlie Hart. 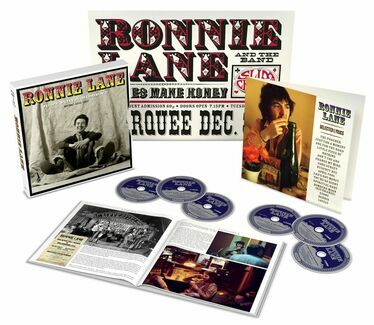 The Ronnie Lane Just For A Moment 6 CD Box Set is housed in a beautiful, built-to-last hard-back book with outer slipcase for display!. This package also includes a book of Ronnie’s lyrics and an A2 fold out poster. Also available a 1CD (Best Of) and 2LP (Best Of) format. ​plus singles, live concerts and studio session tracks! plus singles, live concerts and studio session tracks! CD1 TR 19 Flags and Banners (Live At The Thames Hotel 1973) - rare concert recording found in Stan Lane’s barn. Essentially the band that was the nucleus for Anymore for Anymore. N.b ragtime, skiffle, early New Orleans influences. Bruce Rowland’s superb drumming underpins the whole proceedings, and enables Ronnie and the band to develop the song with a free rein. CD1 TR 20 Last Orders (Live At The Thames Hotel1973 ) - rare concert recording found in Stan Lane’s barn. nb ragtime, skiffle, early New Orleans influences. CD2 TR 20 You're So Rude (Live at Victoria Palace) - robust rendition - rare gig. this demonstrates Ronnie’s showmanship which harked back to music hall. The band on this track and the next one, were the new line up following the release of Anymore for Anymore and the demise of the Passing Show. The approach was more rock-orientated, though still featuring many acoustic instruments and demonstrates Ronnie’s musical direction was already evolving. CD2 TR 21 From The Late To The Early/How Come (Live at Victoria Palace) - medley – same gig. nb Ronnie’s use of unusual triplets and polyrhythm in both these songs, one of his trademarks, and a departure from rock and roll norms of the time. ‘From the Late to the Early’ was also known as ‘Lost’ and was part of the Mahoney’s project. The triplets form the basis of the segue into How Come, and this often delighted the audience while taking them by surprise..
CD3 TR 15 – Last Orders (Slow Version / Fishpool Sessions) UNRELEASED. This was a late night session at the Fishpool. Although this song was often used as the opener for live shows, and given a goodtime rendition, Ronnie was keen to record a version that reflected the poignancy of the subject matter (true story of chance encounter with past girlfriend). Note the humorous reference to the pianist (me!) half way through. CD3 TR 16 – Lonely (Fishpool Sessions) UNRELEASED Ronnie was heavily influenced by all things Motown, and this came into play mid seventies, after the essentially country direction of Anymore for Anymore, and after the release of One for the Road, which was essentially a concept album describing his love of the life in Shropshire. Lonely, has a typical Ronnieish bass line, and is very catchy. I played piano and assisted in building the groove. If he had had proper management at the time it might well have seen the light of day as a single. CD3 TR 17 – Under My Nose (Fishpool Sessions) UNRELEASED. Again a sign of increasing American/delta/swamp influences mid seventies. Ronnie as one of the original purveyors of ‘British Americana’? Ronnie was a great observer of humanity, and was fascinated by people being unaware of things that were staring them in the face. CD3 TR 19 – Going West (Fishpool Sessions) UNRELEASED. Ronnie played around with this song for a long time. It’s essentially about Detroit, the wildness of the road (always an obsession with Ronnie), and Motown again. CD4 TR 12 - Three Cool Cats – UNRELEASED . This song was introduced to Ronnie by Alun Davies. CD4 TR 13 - The Wanderer (The R’n’ B Sessions)– UNRELEASED. This, like the next three tracks was performed by the band that Ronnie essentially worked with at the end of the seventies and early eighties. ( including the Rockpalast sessions). Bruce Rowland, Chrissy Stewart, Henry McCullough, Ian Stewart (who was cheekily poached from the Stones by Ronnie, and who had a great influence on Ronnie’s musical direction at the time), often myself on accordion, and George and Ray Carless on saxophones (both excellent exponents of a very rootsy/raunchy Jamaican approach, which itself heavily influenced New Orleans rnb). It was a wonderful band, and tragically overlooked due mainly to non-existent management etc. CD4 TR 14 - Rocket '69 (The R’n’B Sessions) – UNRELEASED. I’m not sure who is the guitar player on this….but at this time Ronnie was hanging out with Henry McCullough, Eric Clapton, Mick Green, James Honeymoon Scott, and others…. Double entendre enjoyed by Ronnie. CD4 TR 15 - The Joint Is Jumpin (The R’n’B Sessions) – UNRELEASED. Mick Weaver (aka Wynder K Frogg) was involved from time to time and featues on this. Stu introduced Ronnie to this song. CD4 TR 16 - Annie Had A Baby (The R’n’B Sessions) - UNRELEASED, Previously unreleased covers. Ian Stewart’s (stu’s) strong presence on piano. Ronnie’s r’n’b phase is not well known. Ronnie liked the risqué element to this and the previous songs. CD4 TR 17 - Pisshead Blues (Fishpool Sessions) - UNRELEASED track Described by the band as “remarkable tongue in cheek soul searching by Mr. Lane.” Ronnie always liked a good story-based song, like Dylan’s Jack of Hearts, or even Marty Robbins’ El Paso. This but this is a rambling account which more than likely was built from Ronnie’s own experience. Surreal bar room tale of punch-ups, elopement, drinking and brawling and the like, more carefully crafted than the apparently drunken delivery would suggest. A re-write of Flags and Banners. CD 5 TR 18 Rats Tales (also, intriguingly, known as ‘Catmelody’)– Fishpool Sessions version. UNRELEASED. This was one of the songs (written after the One for the Road period) that Ronnie was proudest of. He viewed it almost as a manifesto at the time. An account of lost love, excess, rejection, redemption, the lyric was honed down in between drinking sessions with local farmers at the Fishpool, and demonstrates considerable lyrical virtuosity on top of typical Laneish dark humour. This version has CH on piano, Bruce Rowland on drums and fine sax work by Mel Collins. Ronnie completed this version, but then the song was rerecorded on Rough Mix, so it was not released, despite Ronnie having been at the top of his vocal powers. CD6 TR 15 Peaches (Arlyn Studio Session 1989) UNRELEASED. Demonstrates great rapport of Ronnie with the musicians he was working with from the start. It feels to me that he had found musicians he was very happy with, and the feeling was mutual. Qv vocal interchanges between Ronnie and the band. Typical Ronnie bass line, Motown influence, nb the fiddle and accordion at end. Ronnie in fine voice all considered, and obviously enjoying the session. Are there echoes of ‘Lonely’ in this song, even after all those years? CD6 TR 16 Sally Anne (Arlyn Studio Session 1989) UNRELEASED. Although Ronnie was in the advanced stages of MS he was still coming up with strong and graphic ideas for songs, and his continued creativity, despite increasing difficulty delivering a vocal, is to be marvelled at. Nb use of acoustic instruments, combined with powerful bluesy groove. CD6 TR 17 Spiritual Babe (Arlyn Studio Session 1989)UNRELEASED. Possibly one of Ronnie’s finest from this period. Fine song and haunting melody . Ronnie was a melody man! He recorded various versions. Paul Weller and Sam Brown did a fine version of this at the 2004 Albert Hall memorial concert. CD6 TR 18 Hearts Of Oak (Arlyn Studio Session 1989) UNRELEASED. These last two songs are again evidence of Ronnie’s creative tenacity, and continued talent as a highly original, intensely melodic, and emotionally powerful songwriter. CD6 TR 19 Strongbear’s Daughter (Arlyn Studio Session 1989) UNRELEASED. Tracks CD6 TR15 Peaches to 19 - Arlyn Studio Sessions - Ronnie still recording. Includes studio version of Spiritual Babe. brilliant that even at this stage Ronnie was writing and recording interesting original material, nearly always based on his first hand experience. Ronnie has a real rapport with the musicians he was working with - typical of Ronnie.